the world is mine: yup, no2, never! 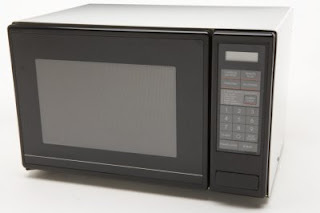 6 foods that should never enter your microwave. The microwave is a blessing and a curse. Yes, it's the speediest way to enjoy last night's leftovers but it can also be the fastest way to ruin an H&H bagel. To spare you the drama and disappointment (we have enough already with trends like manties), here are 6 foods that you should never nuke. Bread : If you want to bite into bread that's hard as a rock, go ahead and microwave it. If, however, you're not a brick bread fan, stick that sucker in the oven. Oh, and don't even think about putting a bagel in the microwave. Pizza : It's the bread thing again - hard as a rock and it also makes your toppings taste dry and dreadful. Ice cream/sorbet : Sometimes it's hard to have the patience to defrost naturally when ice cream is involved, but nuking is not your answer. It is virtually impossible to avoid meltage. Instead put your ice cream scooper under warm water and be prepared to work those biceps. Fruit : Fruit by definition is sweet and juicy. Nuked fruit is dry and nasty. Cake : Repeat after us: Cakes are for baking, not nuking. If you need to warm it, pop it in the oven. Try one of these easy cake recipes for the baking beginner. Eggs : An egg in the microwave = an explosion. Don't do it.